An inviting living room features modern furnishings and a large 75 inch flat screen QLED smart TV. 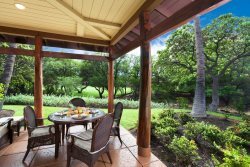 The dining lanai presents a generous outdoor living and entertainment space and features an outdoor kitchen, built-in BBQ and a dining table with seats for four. The kitchen is integrated into the open-plan living and dining area and features high-end appliances, a breakfast bar with four barstools, and a dining table for four. The master suite offers a king-size bed, 52 inch flat screen TV and a spacious bathroom with a deep-soaking bathtub, a separate walk-in shower and dual sinks. The guest bedroom offers two full size beds, flat screen TV and is near the main bathroom. There is a sofa bed in the living room. Also included is a full-sized washer/dryer, air conditioning and ceiling fans, ice chest, boogie boards, beach chairs, snorkel gear, beach towels, and complementary garage parking and complimentary WIFI. Also within a 2-3 minute drive is the famous Anaehoomalu Bay (A-Bay) beach with all the joys of white sand, trees, snorkeling, paddling, gorgeous sunsets, and more. Further down the road (10 to 15 minute drive) are other local beaches.